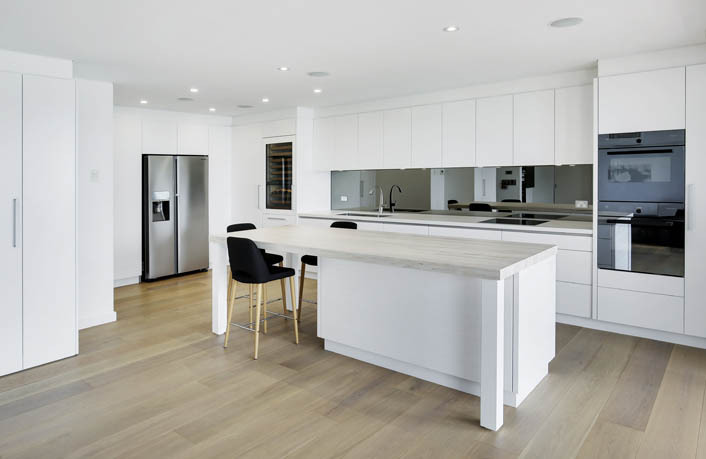 A couple came to Dan Kitchens with the hope of changing their uninviting kitchen into modern entertaining space. 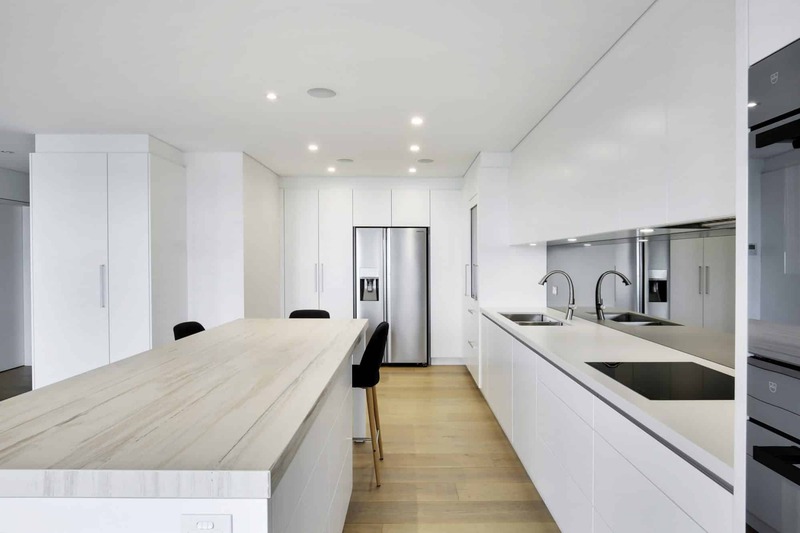 Jason and Nicki knew they needed a new kitchen in their Coogee apartment. 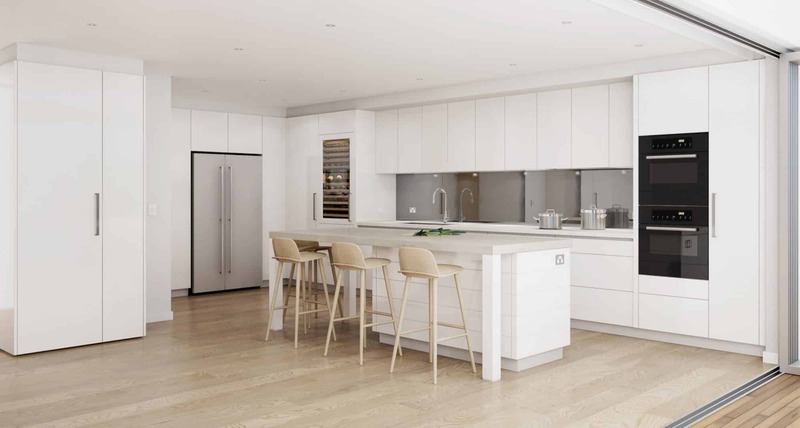 So they called on Dan Kitchens in January 2016 to transform their small, dark and uninviting kitchen into a modern space complete with a large island. The project was finished in February 2017 and the couple now have a crisp and clean kitchen that they love. 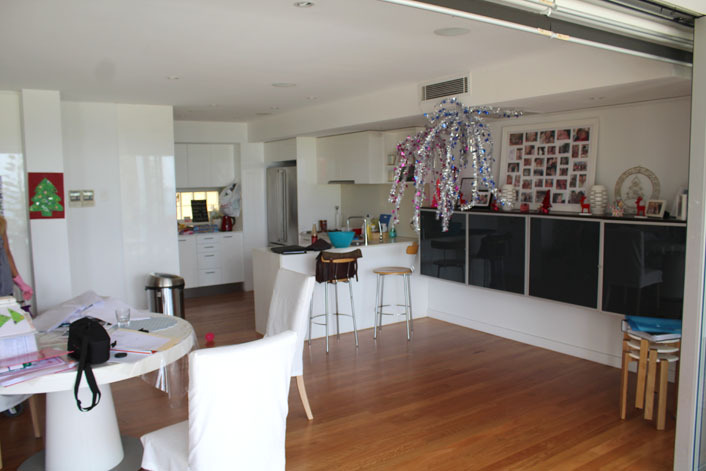 The apartment kitchen was remodelled so it would become the focal point of the apartment. The couple also wanted to entertain more, have family and friends at their place, especially their daughters’ friends who would visit more during the teenage years. “We wanted a kitchen that would accommodate a group of people to sit comfortably and socialise,” Jason says, in our old configuration, food was frequently taken to the couch because the kitchen was too small. The new kitchen is so practical – we can cook, eat, drink and socialise. The party is now drawn to the cook. The cook is no longer in a rush to join the party” he says. Before: The original apartment kitchen and buffet divided the space inefficiently. After: A completely different feel. The space feels more open and is connected to the living room. Sight lines now lead the eye past the galley towards the view beyond. 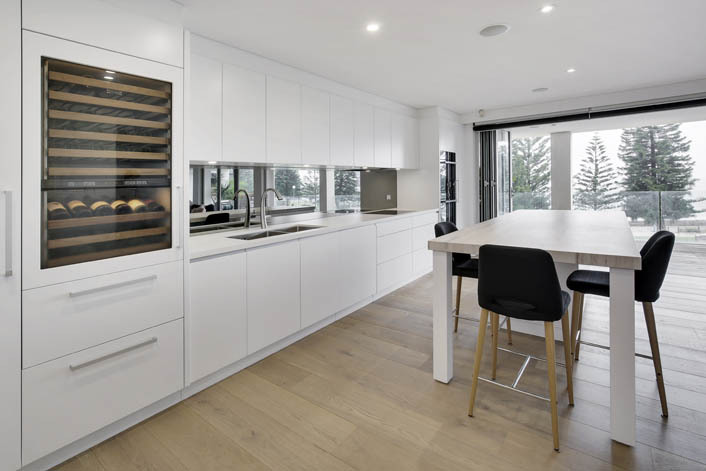 Jason says one of the standout features was the smoked mirror glass splashback, which he describes as “really complimenting the white cabinetry”. He says the reflection made the apartment feel larger. “LED cool white lighting was installed under the island bench top and at night it creates a great ambient light,” Jason says. The couple also installed a Franke sink with KWC Zoe tap. Jason says the tap looks ostentatious on its own but once installed in the kitchen, it compliments the size of the space. 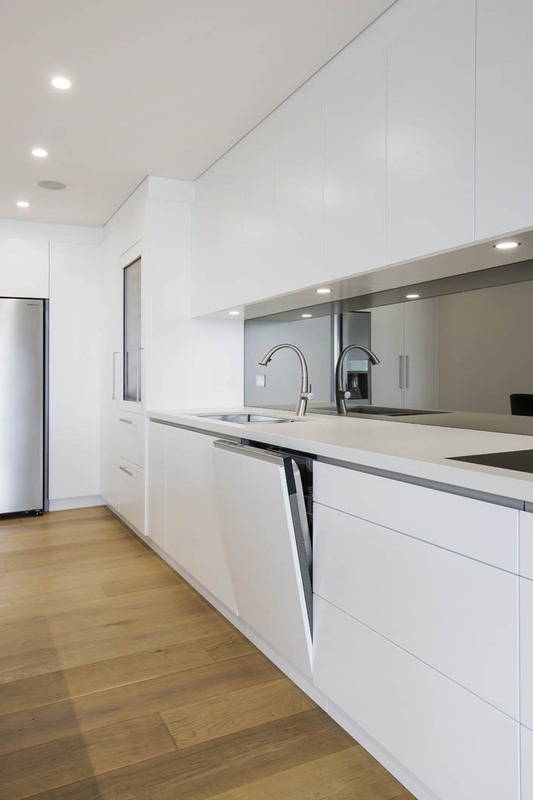 Galley style design with a 2.6m long island benchtop. Large bench for cooking and cleaning. The smoked mirror makes the apartment “feel larger”. 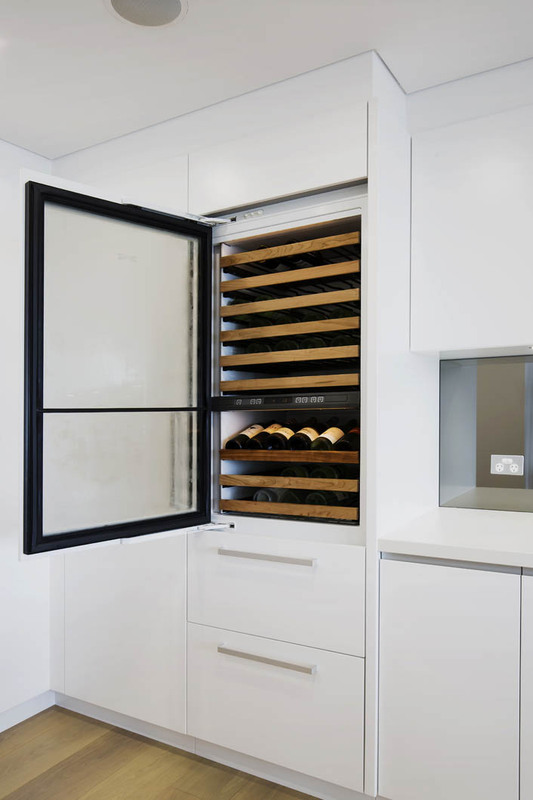 Integrated Sub-Zero Wine Storage, a good choice for wine preservation. Integrated VZUG dishwasher & KWC Eve tap behind. The couple trawled the internet until they found a company that had designed kitchens similar to their tastes. Like most people, the couple had unpleasant experiences with builders in the past, however, that was not the case with Dan Kitchens staff. 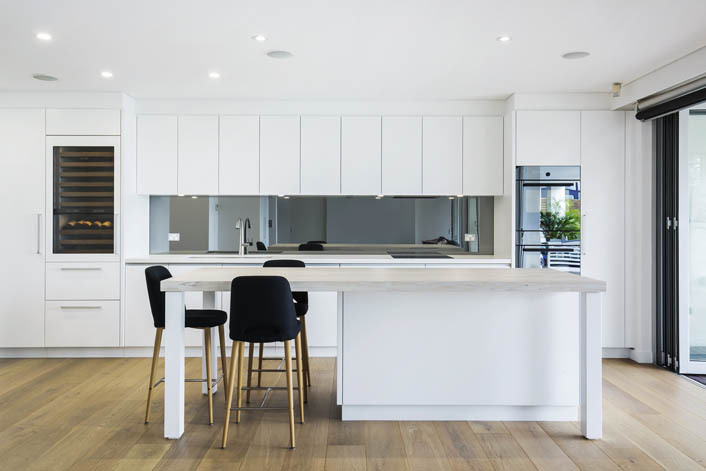 “From Daniel in the design stage, to Greg in the final measure and schedule implementation, to Matt and Mitch installing our kitchen – they all delivered within the timeframe and to the quality they promised,” he informs. Jason confesses there was nothing he or his wife would do differently in their kitchen. 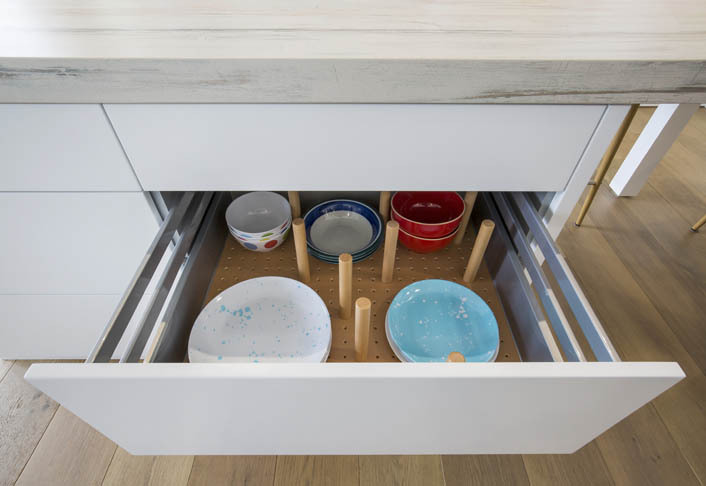 “Using experts like Dan Kitchens ensures that you are unlikely to dwell on what you could or should have done in hindsight,” he says, “for example, during installation, we thought the island was too big for the area. This was because it was a big shock to move from such a small kitchen to a feature so commanding in the apartment. After a few days of adjustment, it was clear that Dan Kitchens designed the island’s proportions relative to the rest of the kitchen. Had we been in control, half way through the installation we probably would have panicked and reduced the size of the island. That would have cost money and most importantly, it would have been a big mistake” explains Jason. 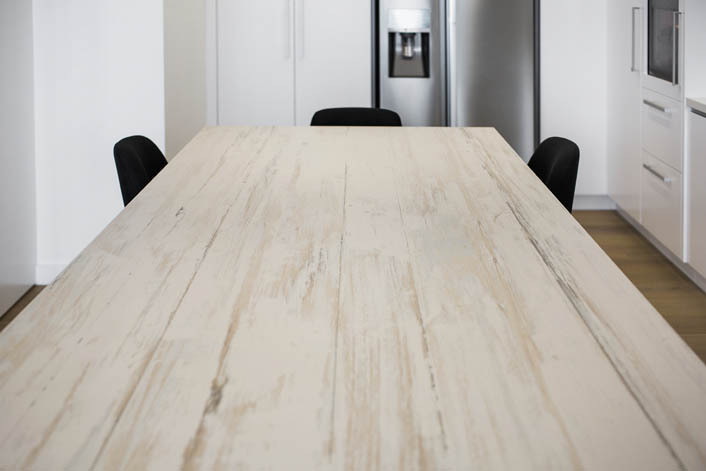 Island benchtop in Dekton with a “beachy” style timber pattern. 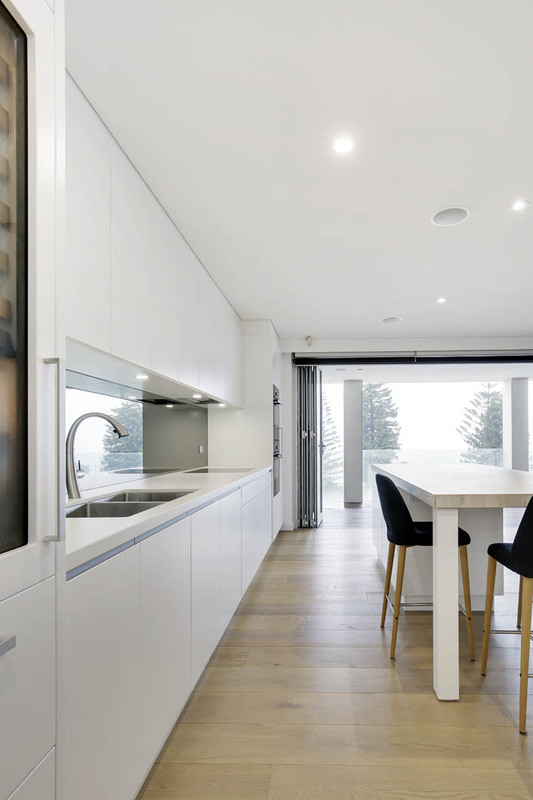 Slimline and integrated handles create a minimalist look for this beach-side apartment kitchen. Not far off the final design: A 3D illustration produced by Dan Kitchens during the design process. Dan Kitchens have been renovating apartment kitchens for over 30 years and is regarded as one of the most trusted in the industry. 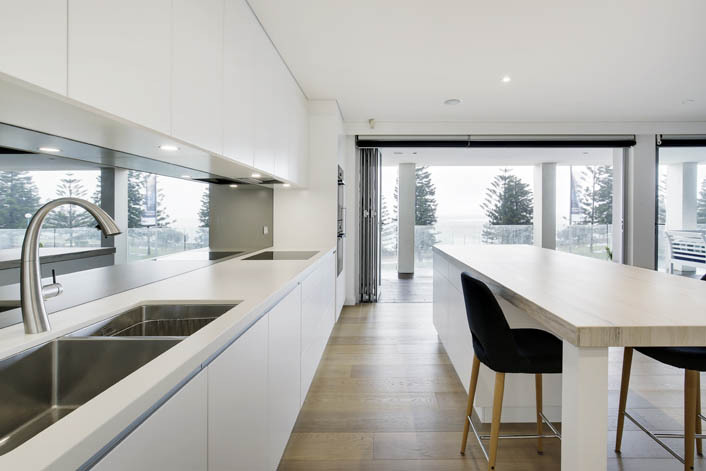 Contact their Design Studio on 02 9624 2344 to enquire about your own kitchen reno project. Alternatively, visit the Dan Kitchens showroom and speak to a Designer in person.